Stop by Preschool Storytime from 10:00 to noon at Bethany Branch on Thursday, February 7, to get a FREE dental health kit that includes a toothbrush, toothpaste, floss, and sugar-free gum. Then, pick up a healthy snack at our fresh fruit pop-up stand! 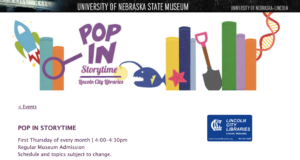 Pop In Storytime Free with Regular Museum Admission Topic: Hibernation Pop-into the museum for storytime with Lincoln City Libraries the first Thursday of each month. Through stories, songs and movement we’ll learn more about the natural world. Everyone is invited to participate, however stories and activities are planned for ages 3-5. Thursday, February 7 | 4:30-8:00pm Free Thursday Night Museum Admission Pose with the plesiosaur and mingle with the mammoths in Morrill Hall for free on Thursday nights from 4:30-8:00pm throughout February.